The beauty of Harford County can be yours to enjoy in the luxury of your own home with a well-constructed screened porch. Summer’s over, but your enjoyment of the outdoors is not. Autumn is still a great time to enjoy a comfortable outdoor experience, as the leaves turn delightful colors and temperatures gradually cool to transition into winter. The beauty of Harford County can be yours to enjoy in the luxury of your own home with a well-constructed screened porch. Many houses already come with their own porch: a wood or cement outdoor area that’s often elevated above the ground to provide the best view. A screened porch provides all of the benefits of an open-air porch without allowing in annoying bugs. The sun will stay above you, illuminating the outdoors; however, you will sit in the shade and enjoy lighting on your terms. You can also bring over friends to enjoy a calm afternoon of conversation without worrying about the busy mosquitoes and bees preparing for the winter. Because the porch is enclosed, you can place decorations outside that would normally be ruined by rain and wind. You can even choose to enclose your porch with fiberglass instead of wire mesh. That way, you can enjoy the beauty of Harford County when the leaves have almost all fallen or when the flowers begin to bloom in the spring. The best way to build your screened porch is to hire a professional contractor who can give you what you need right away. You will save money compared to building an entirely new room, as a porch doesn’t require a new foundation addition or the complexities of air conditioning and plumbing. A well-built screened porch will take between 2 and 4 weeks to complete. The contractor will be able to tell you this right away and provide a fair quote before beginning work. In order to find the right choice in Harford County, look on social media sites and review sites for the top choices before investigating the companies’ websites. This will take less time than approaching the companies individually and in persona, and it will be less awkward if you have to turn one down. There are even independent websites that will help you look for a contractor directly. Contractors are the best way to reach your goal of a screened in porch, and with the proper research, you will have no regrets about choosing to build this addition. Freedom Fence and Home, which services the Harford County area, provides screened porch construction for homeowners who want to improve the look, and value, of their homes. 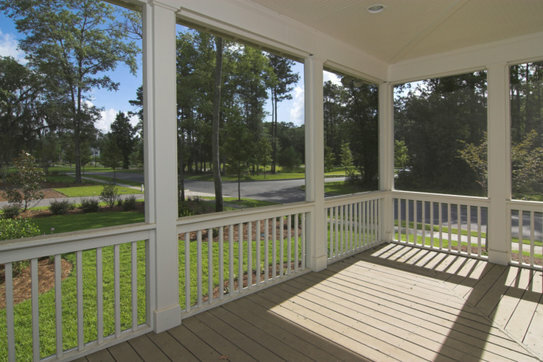 Our crews are highly trained and have been performing screened porch construction for years. You can view our gallery to familiarize yourself with our work. If you have any questions, please contact Freedom Fence and Home by calling 443-271-6841 or visit ourwebsite. You can also follow us on Facebook and Twitter! This entry was posted on Friday, October 16th, 2015	at 5:22 pm	. Both comments and pings are currently closed.